First of all, I have to say sorry Kaname&Kitten you deserve so much better. I'm not fond of this wall at all so I'm not in the mood for long descriptions either. Thanks to bouinbouin&epsilon86 for uploading such nice scans. I started working on Kaname a while ago but due to my lack of free time I couldn't work, so I sort of finished him a while ago in 2 days and a half, it went pretty smooth, it has 92 layes, yes I counted. The background killed me and I still think it doesn't do justtice to the vector, I stared at it for days and still no good idea poped up. Also I wanna thank To Sin-chii and Ana-chan for their support it really helpped. Oh well, enjoy it or not. All support is appreciated. Thank you. omg kaname! <33333! (finally! ) 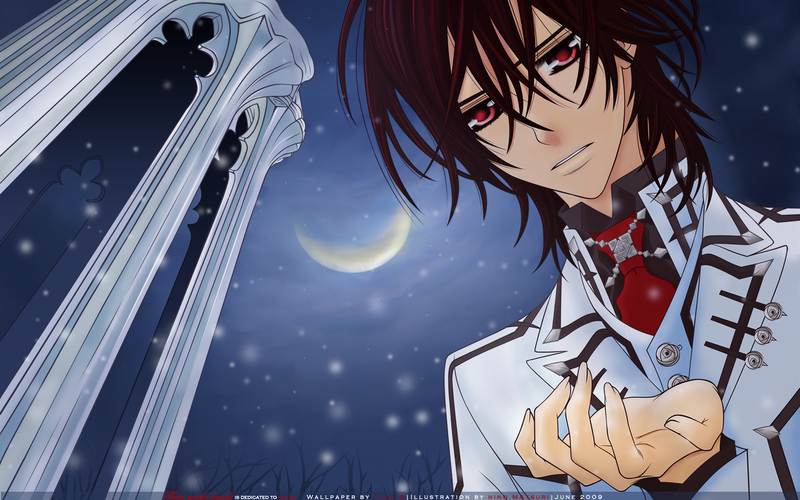 u're kaname fan? right? i love u! Toatally love this wall of kaname! i lurv the background even your vector and painting skils WOW! Look really awesome! I just think that the lighting on his hair can be brighter and more obvious to bring out the contrast~. But still it is a beautiful wall! O_____O Sugoi desu ~ this is amazing! you added snow which made me love it more. them darker. Other than that it's such a gorgeous wall and I really love it. its a fav & a highlight! Kaname Is The most Beautiful & Handsome Boy! And I love the sky. <3 Well done! *__* IT'S KANAME AFTER ALL! ... :P i 'm really a baka fangirl! hahahah anyway.. i just love his eyes, and the way you did them are gorgeous, hair was nicely done AND i would take his haaaaaaaand, if it were meeee! omg.. this is really beautiful.. i love the background! it's like, he's inviting you into a world of serenity... or he wants to take you to the moon. lovely art! i dont like the area around the moon, it stands out a bit, but that's just me. and um... if he is facing against the moon, how come he is so lighted? but you know... its just great to look at if we ignore the physics. I mean it does Not have to be "real". it just has to be "beautiful" or so i always feel. Art knows no laws.